Eddie Richardson was for many years a dominant figure in Britain's criminal underworld. He was at the top of his game at a time when he who packed the biggest punch survived. In his revealing autobiography, he explains how he and his family rose to gangland prominence, how his dodgy deals brought him to the attention of the police, how he became a living legend and how he almost lost it all. For the first time, he talks frankly about his rivalry with the Krays, the family feuds that ironically brought him into greatest danger, being in prison and the celebrities, toffs and coppers who shared his life of crime and violence. With brutal honesty, he describes the motivations behind his lifestyle and explains why, for him, it was only ever a question of survival. He reveals that despite the hard-man, tough-guy image, his biggest weakness was putting the safety of others before his own. S. Gordon (London): Bookshops seem to be teeming with gangster and crime memoirs these days. If you want to try and sift through the distinctly average books then I would definitely recommend Eddie Richardson's 'The last word'. Eddie Richardson is honest and does not go out of his way to prove that he is some kind of hard man and neither does he seem to have been bothered about obtaining any 'gangster' image although neither did he shy away from it. It is not so much of a gangland book, more the story of a man who has seen the best of life and the worst of life. Certainly it does not seek to glorify criminal activities and paints a very stark picture of life in prison during the 60s and 70s. He tells stories that are sad such as the death of his brother, Alan, at a very young age but other stories that will make you laugh out loud. When you see his talent as a painter it makes you wonder what his life would have been like if he had discovered it earlier....definitely worth buying. Mr G. Kirby (Greenwich, London): An easy to read book giving a very interesting account of life as the author sees it. As the chapters unfold you are exposed to the human face of Eddie. A family man loyal to his friends rather than the gritty gangster portrayed by the media. After finishing the book I was left with the impression that there is another book in him. Maybe his version of the events leading up to the notorious torture trial. 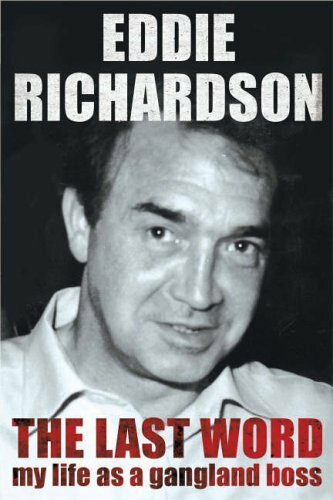 Tom Daly: So many different things have been written about Eddie Richardson over the years, from being a thug who tortured innocent people to a criminal mastermind who ran one of the toughest firms ever seen in London. Finally Eddie has come out with his own account of his life, not necessarily the full truth but a very frank and detailed protrait of his life and what set him on the road to a life of crime. From his time growing up in London to his long stretches in prison, this book is a great read and seems a lot more creditable then his brother's, Charlie's book. I was shocked to read about the falling out between the two after finishing Eddie's book and the opinion he had of his brother. This is a gripping and often humerous book of a man who wielded power and was held in both respect and fear from those around him.